In the Young Jump 2015 Issue No.27, they did interviews with 6 members of interest. 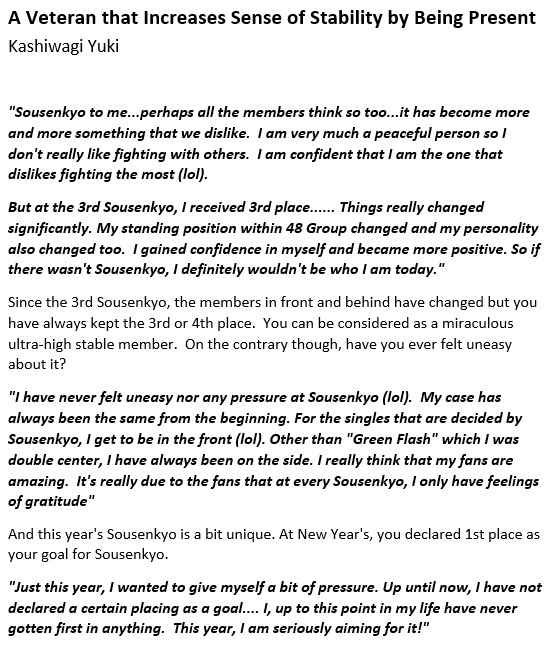 Below is a translation of Yukirin’s Interview. It is interesting to see that so many people think of Yukirin the same way, and know her well. I believe someone said it somewhere that when Yukirin gets 1st, there will be a sense of stability to the 48G again! SO I guess Yukirin is already a necessity for AKB? its pretty sad, to know that all this time yukirin always thought that SSK was the only chance where she have possibility to be part of front member. i guess yukirin herself fully aware of her condition inside the 48G. It’s interesting to see that she echos the views we all have about her placement in songs Tiffany but I think that her acceptance of that is something that has been very important to her as many other people would not manage like Yuki has done with what she has been given, she has always done the very best with the chances that have been presented with her and that is a big part of why so many people like her I think. As always, thanks for the translation! !